Blood Of The Dragon is the first album of this band. Dragonhammer sound mature for their first opus but not original at all. Their style is epic metal and lets say it is very close to Rhapsody and Labyrinth (maybe too close ;-). In fact Dragonhammer is a big melting pot with all the "clichés" seen and heard a thousand times: dragons, middle age related tittle tracks, war sound intros, fast and melodic solos and breaks with keyboards or harpsichord adding a big prog touch. The production keeps me thinking once more to Rhapsody because the double bass drums and the keyboards are put forward . It is technically and musically inspired for a debut album even if the chorus are not very originals. The first song Age Of Glory is great and maybe the best of the album. Black Sword has a keyboard line which reminds a bit of The Best I Can from Queensrÿche. Blood In The Sky is as silly as its title and sounds very much like Primal Fear. You hear in almost every song something taken from another band. 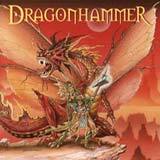 The song Dragonhammer is of course a must with a catchy chorus. The two ballads are boring and join my point of view miss the point.